HP has been showing off a concept netbook based on Android at CES. Packing a Qualcomm Snapdragon processor, an HP rep was happy for us to take these snaps but held his hands underneath it when we fondled the netbook "in case we dropped it". 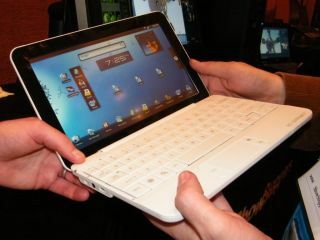 As the Snapdragon concept boasts integrated 3G, the netbook is always connected. The prototype looks like a very thin HP Mini, but doesn't have an escape key "because in Android, you always go back" said our rep. The HP Slate shown off by Steve Ballmer last night has already left Vegas, despite HP's promises that it would be on display at another event in the city. As well as that Slate, HP is also rumoured to be working on an Android version, too. It'll be interesting to see the price differentiation between the two. And then, of course, there's Chrome OS. Where does that fit in?